Days after nine people were murdered in a racist attack on a black church in Charleston, and after studiously ignoring the issue for as long as she could, South Carolina Governor Nikki Haley is holding a press conference at 4 p.m. today, where she’ll reportedly call for the removal of the Confederate flag that flies over the statehouse. The hashtag #TakeDownTheFlag has been trending on Twitter, and even Jeb Bush and Mitt Romney have said — Romney bluntly, and Bush less so — that the flag probably shouldn’t be there anymore. The Confederate flag is not the flag of states’ rights. It’s the flag of racism, and it flew high as a young, angry, ignorant white man murdered 9 innocent African Americans — just as it flew over countless racist killings before. 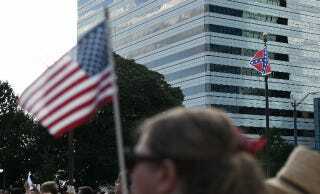 The Confederate flag has flown in America for 150 years too long. The Civil War is long over. Fortunately, our First Amendment right gives us the power of free speech that will allow us to display our feelings by burning the flag of slavery from sea to shining sea. Join us for a PEACEFUL DAY OF PROTEST and burn the Confederate flag.